to be honest i didn't comment because i can't make out much on the scan. i'm not sure if those are clips in the liver from previous chole or sreious stones or contrast from fistel. sort of think there might be air in the liver but not sure. makes me wonder about the quality of the image on my computer. you'll have to help uus a bit here. what did you see on scan? Was off the computer for a while. Sorry for the delay. Only 2 comments though. Ol' Doc Schwab can riff on pilonidal diseaee and he gets 20 commebnts.... alas. Such is the hierarchy of surgery. 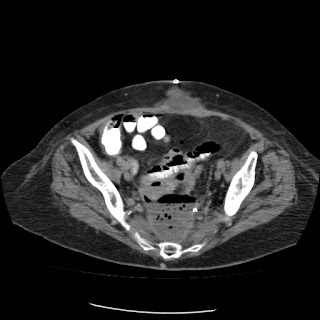 Image one suggests a low pelvic abscess with air. Image 2 shows a right upper quadrant abscess with air bubbles. Image three suggests an extremely dense, irregular object adjacent to the abscess. Final radiology read: likely foreign body. I took her to OR. 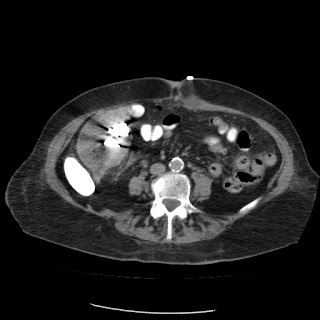 Right upper quadrant fluid collection indeed was a large abscess with a retained lap sponge. The abscess in the pelvis had some green liquid associated with it; I was concerned about perhaps an anastomotic leak so I did loop ileostomy as diversion. Washed everything out and placed drains in the residual abscess cavities. Post op day 2 there was bile in the right upper quadrant drain.... any ideas why? I scanned her on Post op day five . The right sided JP drain was putting out 30cc a day of bilious fluid. 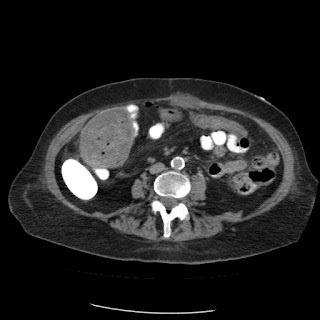 The scan essentially showed a small, well drained fistula from small bowel (not duodenum) to into the drain. It should close. Most bile is passing into the ileostomy. Interestingly, the pelvic drain is now putting out a thick black feculent fluid, consistent with original hypothesis of anastomotic leak. this is a nightmare for a surgeon small and large bowel fistulae, need TPN till fisutla close ,, did it close after ? stope anti platlets prepaire the patient regarding anti platelates reexplore the patentes reanastomosis cover with adequetes antibiotices.